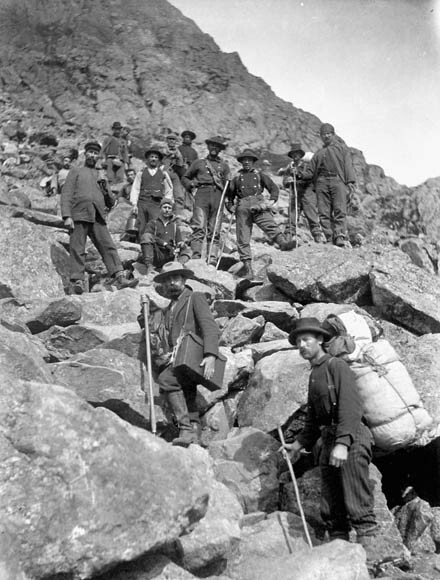 Damn Yak Dry Goods Co.: The Klondike Quest: A Photographic Essay 1897-1899. The Klondike Quest: A Photographic Essay 1897-1899. This book should be on every one's shelf who appreciates the early outdoors equipment, photography, and hardships of the human. While not all the images are pleasant, most show the struggle and hardship of what Pierre Berton has called "one of the strangest mass movements in history." 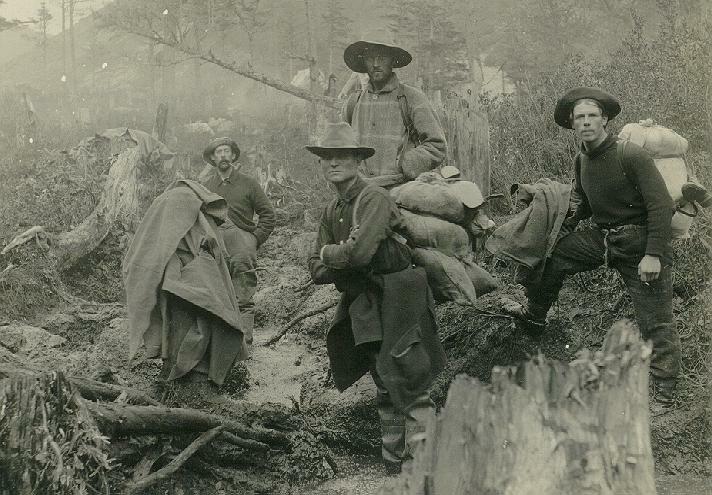 Apparently the Klondike Gold rush was one of the most photographed events of the 19th century, so one could imagine the fantastic photos archived in this book. I haven't read the full book by Pierre Berton, but there is a fair bit of summarized reading regarding the images which makes this book great for your coffee table. 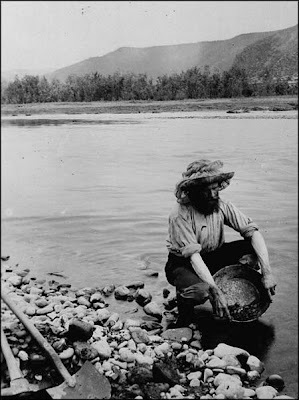 In a nutshell, the Klondike Gold Rush was spurred on by a small amount of gold and huge newspaper hype. This mixture caused a mass uproar of approximately 100,000 people to drop and leave everything behind to get to Dawson City via the mountains and the famous Chilkoot Pass. Then when arriving, only to find out that most of the gold fields were already claimed. In the end about 4000 people were to actually strike gold. It was quite a endeavor as most people were not well versed in the ways of the outdoors, let alone the harshness of the deep Yukon. At the now historical park in Washington, Alaska you can hike White Pass Trail. During the gold rush was promoted as a horse-packing trail. That meant a person should have been able to take all of their goods by pack animal up over the 45-mile trail. Even though this trail was supposed to be easier than the Chilkoot Trail, it turned out to be more difficult because of muddy bogs and steep rocky cliffs. Even experienced stampeders could not lead the horses around the obstacles. 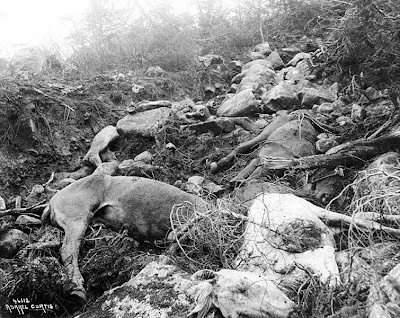 The trail was so rough on horses that 3,000 died along the way, and it was quickly renamed the “Dead Horse Trail.” Author Jack London said about the Dead Horse trail "The horses died like mosquitoes in the first frost, and from Skagway to Bennett they rotted in heaps." This is quite an epic book for sure, the photos tell as much of a story as the words beside them. Unreal photos here. What's going on in the wide shot, with the long line of people scaling that snowfield? Were there really *that* many people crossing the pass that day? 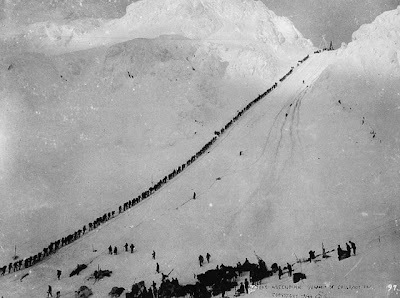 That is the Chilkoot pass, there was that many people walking up it for weeks, months! Wild. 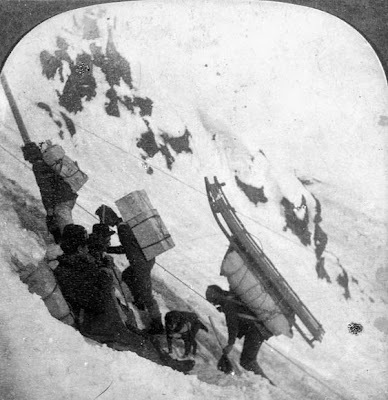 And look at the load that one dude is hauling: a ginormous pack, *plus* a 9-foot toboggan! An essay writer online her works only writing content on a different topics, Essay writing and many other such materials. And this work is all that much popular nowadays. A praying life, being a solid technique for discipline, can help in this procedure. This week we’ll get a global, local and leader perspective on success as an entrepreneur. Sir Richard Branson as a globally recognized entrepreneur, who has even been knighted based on his entrepreneurship! If you want to read more about Virgin Hotel then please click on author button. Writing an assignment is a stressful and dreaded task for many students. You can make writing process more pleasant and easy. Visit our website http://www.canada.customessaywritingservices.com/why-our-essay-writing-service-toronto/ for more information. We are here to help you every kind of writing work. We have highly-qualified and certified experts in the team that are continue working 24x7 and even continue giving its unlimited free revision services. If you are a university student in the UK and demanding for Do My Assignments Uk services then rush at StudentsAssignmentHelp.com and make sure all your work is completed well. Very smart information shared and I guarantee that you will engage more read if you continuously publish such interesting article on this blog. You can also stop adult popup ads and remove fuq.com virus from PC and secure your system.